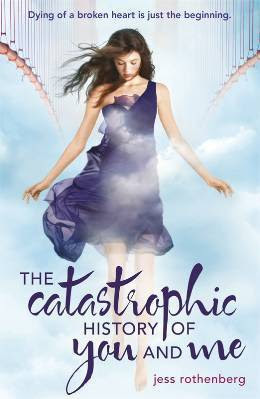 THE CATASTROPHIC HISTORY OF YOU AND ME by Jess Rothenberg. When Brie’s boyfriend of eleven months tells her that he doesn’t love her, it breaks her heart. Literally. Now that she’s officially dead and gone, she has to try to make sense of love and life before she can move on. With the help of Patrick, Brie’s new guide and resident Lost Soul, she will learn how to navigate the strange new world of the dead. Patrick teaches her how to zoom from place to place in the blink of an eye, how to go back to visit those she left behind in the real world, and even how to move objects. In her visits with her loved ones, Brie discovers that she didn’t really know her family, her friends, or even herself as well as she thought she did. In this fun twist on a paranormal romance, Rothenberg gives us a story that is both sweet and sentimental, a heartbreaking yet hilarious look at the grieving process from the other side of the grave. As she moves through the five classic steps of the grieving process, Brie discovers that learning to live again isn’t just for those who have been left behind. This book is a fun and thought-provoking read for anyone who has ever loved and lost.